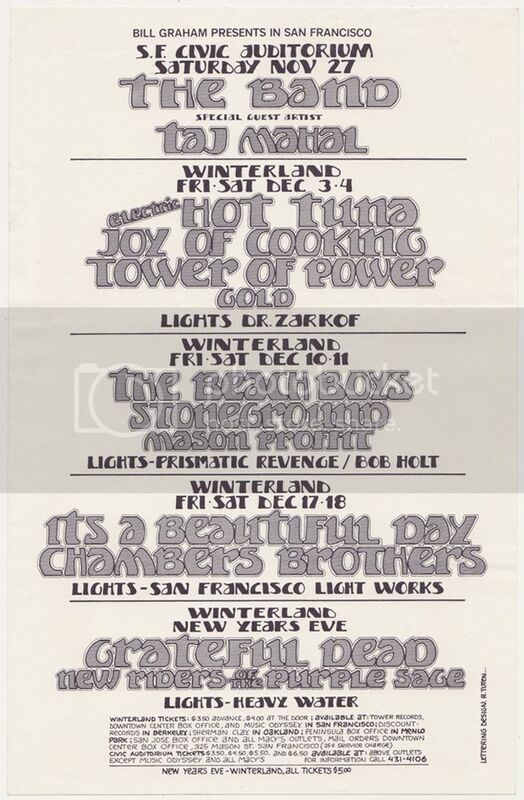 This marquee style flyer handbill is a ‘Bill Graham Presents In San Francisco’ various artists. It measures 5 ½ x 8 ½. Original First Printing, not a reproduction. Concerts featured: THE BAND, TAJ MAHAL, HOT TUNA, JOY OF COOKING, TOWER OF POWER, GOLD, THE BEACH BOYS, STONEGROUND, MASON PROFFIT, IT’S A BEAUTIFUL DAY, CHAMBERS BROTHERS, GRATEFUL DEAD & NEW RIDERS OF THE PURPLE SAGE. Concert venues: S.F. Civic Auditorium and Winterland in San Francisco. Concert Dates: November 27-December 31,1971. Handbill measures: approx. 5 1/2″ x 8 1/2″. Lettering Design: Randy Tuten. Handbill is very clean, and in Near Mint to Mint condition. Promoters created handbill versions of many of their posters and used them as handouts and fliers to promote upcoming shows. These handbills represent an important element of music history because they are unique marketing tools that are still used today. One more chance to snag a piece of music history. Categories: MUSIC, PAPER PRODUCTS, Handbills. Tags: Bill Graham Presents, Grateful Dead, rock & roll. Be the first to review “Bill Graham Presents flyer handbill GRATEFUL DEAD, THE BAND, THE BEACH BOYS (1971)” Click here to cancel reply.